The sun is shining, flowers are in bloom, trees are leafing out, and the bees are buzzing. Spring is in the air—and so are the allergens. This perfect time of year can also bring those dreaded seasonal allergies. Many of us deal with spring allergies, but these can be particularly hard for our elderly loved ones. Allergy symptoms may be hazardous for those with chronic diseases, and even over-the-counter antihistamines can have dangerous side effects. How do they feel? Some caregivers assume that the seniors do not get seasonal allergies, but this is not true. Many can suffer from allergies just like someone half their age. They will show signs of a runny nose, itchy eyes, and sneezing, like many of us. Also, don’t assume that because they never had seasonal allergies in the past that they won’t get them. Adults can develop allergies even into their golden years. Monitor how they are feeling to see if they are suffering from allergies. Consult with their physician. 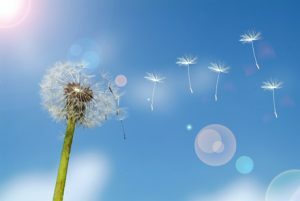 Most doctors won’t diagnose seasonal allergies alone, especially when they are focused on the patient’s greater health problems. As a caregiver, if you notice that your parent is experiencing allergies let their doctor know. Avoid over-the-counter antihistamines. Although allergy pills are widely used, these can be detrimental to seniors. Harmful side effects of over-the-counter antihistamines can be extreme drowsiness, confusion, dizziness, and dry mouth. These allergy medications can interact with medications commonly prescribed to seniors, ranging from mood swings to changes in behavior and insomnia. It is best to consult their physician for allergy relief. Washing off the pollen. We have all been cooped up too long inside this winter. As the sun comes out, we want to head outdoors to soak up the rays. But remember, during your time outside pollen will stick to your clothing and hair, and can be tracked back into your home. Immediately upon coming indoors, remove your shoes, wash your hands, and consider taking a shower to keep pollen out of your home to prevent symptoms. Close the doors and windows. As the weather heats up, it is tempting to throw open the windows and doors and let in the breeze. But with that, you are also letting in large doses of pollen into your home. It is better to keep your doors shut, and the windows of your home and car closed to keep symptoms at bay. Watch the pollen count. As you plan your outdoor activities, keep an eye on the pollen count and plan accordingly. If you do have to go outside or spend time in the garden, wear sunglasses to help protect your eyes against pollen irritation. Caregiving is not easy, but if your loved one is not feeling good, then your job can be even harder. And if you are also experiencing seasonal allergies, make sure to treat your symptoms and care for yourself as well. For more tips and information, visit the Asthma and Allergy Foundation of America.